The starting point of this study concerns the origins of the polycentric nature of contemporary cities in the western area of the Netherlands, commonly known as ‘the Randstad’. 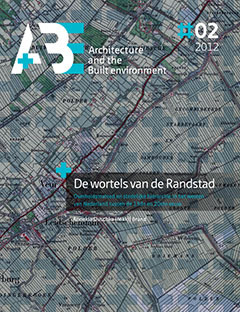 Within the disciplines of planning and urban design the Randstad is considered a textbook example of a polycentric urban hierarchy. Yet, although quite a popular topic, very little is actually known about the driving forces that have given shape to existing urban hierarchies throughout the world. Moreover, the Randstad has also been dubbed ‘Holland’s paradox’ because of its assumed reversed evolution from a primate city hierarchy focused on Amsterdam in early modern times, to a polycentric hierarchy in the 19th century. Why do urban hierarchies change over time and which factors were decisive for the rise of the polycentric Randstad? This study consists of two parts and six chapters. Part I explores the determining factors of change within urban hierarchies. The first chapter gives an assessment of the usefulness of existing theory and ends in confusion: firstly, historiography turns out to be a medley of explanations that are heterogeneous and sometimes even contradictive. Secondly, comparisons of the long-term development of multiple towns are lacking, which makes it difficult to come up with a theoretical approach. In order to make such comparisons and ascertain the impact of certain factors on urban hierarchies over time, it’s necessary to look at the development of a group of towns over a long time-span. Therefore, in the second chapter, simple statistics are compared with existing theory and literature. To do so, demographic data for the nine towns of Amsterdam, Haarlem, Leiden, Delft, The Hague, Rotterdam, Dordrecht, Gouda and Utrecht were compared from their first appearance in the 13th century until the end of the 20th century by projecting their demographic hierarchy in a graph and on a map. In this manner explanations were measured on their applicability for the case of the Randstad. This explorative exercise results in both a description of long-term change in hierarchy in the Randstad and a theoretical approach. Long-term change in the urban hierarchy of the Randstad roughly proceeded in three phases. In the Middle Ages there was a polycentric hierarchy wherein the oldest cities, Utrecht and Dordrecht, were dominant. Although all towns in Holland grew rapidly in the 14th century, by the 1560s one of the youngest and smallest towns, Amsterdam, suddenly took the lead. In the second phase, between 1560 and 1795, a monocentric hierarchy developed with Amsterdam as a primate city. In this dynamic period, where many towns changed ranks, severe growth followed by shrinkage occurred simultaneously with sharpening inequality between towns. In the third phase, between 1795 and 2000, the hierarchy became polycentric once more, with a group of large towns taking the lead. This was mostly due to the extraordinary growth of Rotterdam and The Hague. In contrast with the second phase, the parallel appearance of sharp growth and inequality did not coincide with change in ranks. As a conclusion of part I, in chapter 3 the three determining factors for change in urban hierarchies over time are identified. Urban hierarchy is interpreted as a functional division of tasks between multiple centres, which is the result of differences in the towns’ competitive positions over time. The potency of a town’s competitive position is primarily determined by the interaction of (1) its properties on the one hand and (2) the conditions on the international market on the other. Additionally this interaction is structurally influenced by (3) contribution of a sovereign government. Governments can stimulate or disadvantage towns, but have done so in different ways. Part II further concretizes this approach by further investigation of the third factor. Here, governmental contribution to long-term change in urban hierarchies is given priority over the other two determining factors. Chapters 4, 5 and 6 focus successively on the constitutional periods of the Middle Ages (1200-1560), the Early Modern Age (1560-1795) and the Modern Age (1795-2000). These periods correspond to the three phases in long-term change in the demographic hierarchy from chapter 2. The aim of part II is twofold. Firstly, to identify and compare the manner in which sovereign government has been able to influence the towns’ competitive positions from the 13th until the end of the 20th century. Which trends are discernable in the toolbox of competitive advantages and their distribution by the sovereign government? How can governmental influence on change in urban hierarchies best be characterized? Secondly, if possible, to point out which governmental measures presumably contributed to change in urban hierarchy in general and, specifically, to the rise of the polycentric Randstad. Which measures show the most plausible correlation with change within the urban hierarchy? In order to identify competitive advantages for each constitutional period, a further look at the functional division of tasks, the economic context, and the governmental organization is taken in chapters 4, 5 and 6. Subsequently an impression of the distribution of so-called competitive advantages over the nine Randstad towns is sketched. At the end of each chapter the competitive advantages of a period are summed up, and their distribution is compared to the demographic hierarchy of chapter 2, to assess their impact. My research has resulted in the following conclusions to the aforementioned questions. During the Middle Ages a town’s competitive position could be stimulated with (1) international trade policy (safe conducts, trade agreements), (2) national economic policy (protectionist measures, staple- and minting policy), (3) exceptions of generally applied restrictions (town charters, toll exceptions), (4) distribution of governmental institutions, (5) donations of land property and kingly privileges, (6) granting of infrastructural concessions and awarding (7) urban autonomy. Heavy taxing and prolonged warfare were competitive disadvantages. In the early modern era (1) international trade policy, (2) distribution of governmental institutions and (3) infrastructural concessions were part of the toolkit. Heavy taxing was once more a disadvantage. During the modern era simulative measures were (1) funding of infrastructure, (2) industrial policy, (3) distribution of governmental institutions, (4) national spatial planning and (5) popular housing policy. Building restrictions were a negative for a town’s competitive position. The toolbox of sovereign government in general consists of three basic types of competitive advantages. Firstly, instruments that were aimed at the competitive position of one town exclusively, like staple rights, town charters, toll exemptions, donations of property and rights, urban autonomy and the distribution of governmental institutions. Secondly, instruments that were aimed at the region as a whole, like national and international economic policy. Third are side effects or collateral damage of other governmental policies, like prolonged warfare, heavy taxing and building restrictions stemming from spatial planning policy. The last category often turns out to be disadvantageous for towns’ competitive positions. Sovereign government didn’t apply the same variety of measures at every period. The overall package moved from a rather versatile toolbox in the 13th and 14th centuries to an increasingly limited one in the early modern period. In the 15th and 16th centuries, a discernable trend towards diminishing the variation in competitive advantages sets in, resulting in a rather limited toolbox in the 17th and 18th centuries. After a short expansion of instruments in the first half of the 19th century and a subsequent phase in the second half of the same century, where the number of instruments again strongly declined, the 20th century once again showed a governmental toolbox of various nature. On the long term, infrastructure and the distribution of governmental institutions were permanently part of the competitive advantages-toolbox; although before the 19th century sovereign government virtually never initiated the construction of infrastructure. Throughout most of the investigated period international economic policy and taxing played a role. Local exceptions like town charters and urban autonomy were exclusively medieval phenomena while spatial planning and popular housing policy are only found in the modern period. During the Middle Ages exclusive competitive advantages and common measures were both applied. Almost all nine towns seem to profit from this, although Dordrecht was generally more privileged than others. From the 15th century on exclusive privileges gradually disappear and more collective measures are taken, from which Amsterdam seems to profit. In the early modern era, the overall majority of measures taken were collective ones aimed at the common interest of towns or the region. Nonetheless, somehow Amsterdam seems to have profited above average without exception. In the modern era so many ‘collective’ stimulating measures were taken that this resulted in rather different competitive positions spatially. The distribution can best be characterized as a continuous strive for balance. Looking at the distribution of competitive advantages, governmental activity was variable throughout the entire period. Lots of competitive advantages were distributed in the 13th, 14th, early 17th and early 19th centuries. Subsequently governmental involvement gradually increased and in the 20th century government had its hands full continuously. In sharp contrast, distribution in the 16th and in particularly the second half of the 17th and 18th centuries was rather sparse. Strikingly, other measures than instruments that were explicitly aimed at the towns’ interests show the biggest correlation with change in the demographic hierarchy as shown in chapter 2. In the Middle Ages structural warfare coincided with the marked rise of Amsterdam and recession in the others; tax pressure in early modern times correlated with the decline of towns with industrial profiles; and 20th century demographic decline related to building restrictions in modern times. In general, the governmental role to change in urban hierarchy can best be understood as a facilitative one. The abovementioned centers of gravity in the distribution of competitive advantages coincided with periods of economic expansion and demographic growth in towns. This was the case in periods of urban expansion in the 13th-14th centuries and the 17th century. Only in the 19th century did governmental action precede urban growth. Although side effects in general seem to have been decisive, there’s one marked exception to the rule. The head start of the three biggest towns, and the catching up of Rotterdam and The Hague, does correlate with the construction of (inter)national infrastructure and the distribution of governmental institutions between the 1850s en 1950s. This means that the rise of the polycentric Randstad, exceptionally, was created by conscious use of aimed governmental instruments! This study concludes with a striking hypothesis. Via the description of the governmental organization in each period, by accident attention is drawn to the fact that by bargaining over tax funds, towns themselves gathered political influence in the 15th and even power in the 17th-18th centuries. The rise of urban power coincides with stagnation in the distribution of competitive advantages and the disappearance of exclusive instruments out of the governmental toolkit. This, firstly, gave rise to the suspicion that, once in power, urban representatives preferably avoid the stimulation of opponents’ competitive positions. When combined with the fact that, after disabling towns financially and politically, sovereign government in the second half of the 19th century pursued a policy wherein they kept aloof of dominant Amsterdam and stimulated other large towns, a second hypothesis can be formulated. Could it be that the rise of the polycentric Randstad wasn’t coincidence, and that Holland’s paradox was the result of a deliberate reckoning with an old political elite?